The hype surrounding the Internet of Things (IoT) is often focused on personal devices like fitness trackers, but there are many government applications that have the potential to revolutionize public services. In fact, the UK government’s chief scientific adviser suggests that IoT “has the potential to have a greater impact on society than the first digital revolution”. The rise of connected devices coincides with massive population growth in our cities. The World Health Organization reports that for the first time in history, the majority of the world’s population is living in urban areas. This growth is only going to continue – 7 out of 10 people will be living in a city by 2050. Rapid urbanization will exacerbate existing problems faced by citizens including congestion, environmental impact and the cost of providing public services. The development of ‘smart’ cities powered by technology will go a long way towards solving these problems. Sensors crammed into everything from traffic lights and road signs to flower beds and security cameras will help governments understand where problems exist and how to fix them. This kind of innovation has the power to solve everyday frustrations like late trains and full car parks, as well as more serious problems like urban poverty and sustainable energy. But while many believe we’re on the brink of the fourth industrial revolution and IoT technology continues to advance rapidly, the public sector has been slow to catch up. Only 26 per cent of public service organizations are making use of sensor data to monitor or respond to issues. This is particularly surprising when you take into account the huge savings and potential efficiency boost it offers. Cisco estimates the public sector could generate up to $4.6 trillion in cost savings and additional revenues from using IoT technology to increase productivity, lower costs and enhance citizen life. Installing sensors throughout public areas will provide governments with valuable insights. Armed with this information, councils have the ability to simplify daily tasks and increase efficiency. For example, some governments have trialled ‘smart parking’, where drivers are notified of available parking spaces using their smartphone and in-ground sensors. Smart traffic signs can guide drivers to available spots, reducing traffic delay and minimizing the frustration of people driving around in circles looking for a space. Similarly, the New York City Department of Transportation used sensors across the city to identify areas of congestion and remotely adjust traffic signal patterns to clear bottlenecks, reducing time spent in traffic by 10 per cent. The introduction of ‘smart lighting’ trials in South Australia, which monitors motion to turn on street lights when people are around, has the potential to reduce crime and keep communities safe. The Internet of Things can also help governments maintain public spaces, by combining the use of mobile apps with sensors and GPS technology. For example, the City of Boston developed a ‘Street Bump’ app which collects data about the smoothness of streets as users drive around the city. This provides real-time information and exact locations of bumps or potholes that need to be fixed. Sensors also enable preventative rather than reactive maintenance, allowing governments to monitor public assets like bridges, roads and train stations for potential risks caused by weather damage or large amounts of foot traffic. Installing sensors in public spaces enables governments to improve efficiency by turning insights into action. For example, sensors placed around bus stops can detect the number of people nearby. This helps public transport operators gauge demand in specific areas at different times of day to develop on-demand services. Seemingly mundane public services are also transformed when combined with IoT technology. With sensors installed in public garbage bins, for example, local councils can use real-time data to notify staff when a bin needs to be emptied, instead of working to a pre-set weekly schedule. This leads to less trucks on the road and will result in significant savings on fuel and other resources. All of these IoT applications help to make our communities more sustainable and minimise environmental impact by automating services. Many areas have already installed smart street lights that turn on and off automatically to match seasonal changes and adverse weather conditions. Outdoor lighting accounts for more than half of all energy used by local councils in Australia, highlighting the power of smart lighting to reduce government electricity costs and public energy consumption. Cities using this technology have reduced energy consumption by up to 30 per cent. The parking and traffic applications for IoT also help to cut the time people spend on the road, which minimises the environmental impact of fumes. As more government agencies recognise the benefit of tapping into the Internet of Things, we’ll see a growing number of objects and devices connected in the public sector. Research firm IDC estimates government spending on IoT will reach $570 billion by 2018. The next step is to increase citizen engagement with sensors placed throughout public spaces, helping governments gain useful real-time insights they can act on. 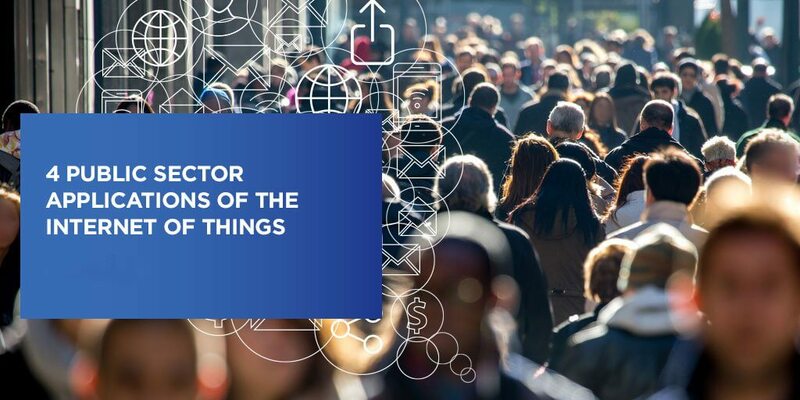 Download our free e-book to learn more about how you can improve public service with IoT applications.